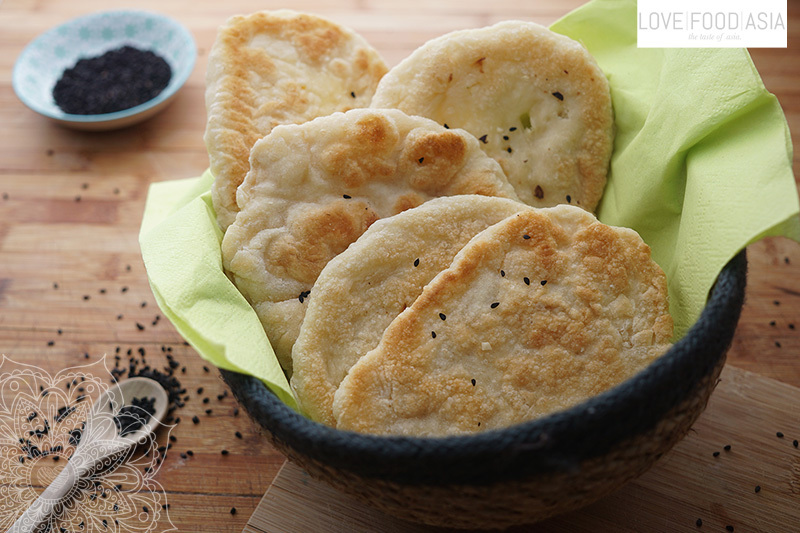 Homemade Indian Naan Bread (Restaurant Style) | Love.Food.Asia. Indian Naan Bread – Everybody loves this famous Indian side dish. Traditionally it is made inside a very hot tandoori clay oven. But you don´t have to worry about the oven. Our recipe is so easy because you can make them in a pan with just 4 simple steps. Our Indian Naan is soft and airy, with the beautiful golden brown spots on the surface. It is super yummy and it tastes like in an typical Indian restaurant. Roti and Naan are both Indian flat breads. They are different because of the ingredients used. Naan is made with different flour and with yeast. First mix sugar, warm water and yeast in a bowl. Stir to combine well. Transfer flour to a flat surface and make a well in the middle. Add the yeast mixture, yoghurt and peanut oil. Now knead the dough until the surface becomes smooth. This can be up to 10 minutes. Cover the dough with a damp cloth and let it rise for 1 hour in a warm place. Divide the dough into 8 equal portions and make a flat circle using a rolling spin. The dough shouldn´t be to thin. How heat a pan, add some more peanut oil and fry the dough on high heat. When it puffs up and bubbles and burnt spots appear, flip it over and cook the other side. At the end brush the Naan with the Ghee and serve with one of our Indian dishes. It´s perfect with Paneer Butter Masala or Shahi Matar Paneer.